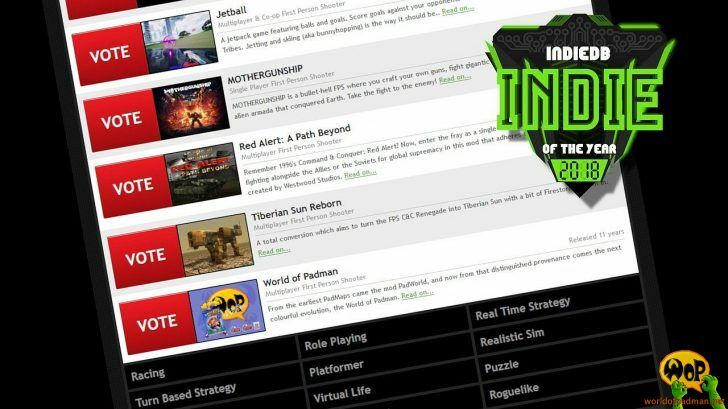 Imagine that, World of Padman is back in IndieDB’s list of the Top 100 Indie Games of the Year in the section of First Person Shooter. We cannot believe it, thank you so much! You can keep on voting, but we already reached our goal for this year to be listed and nominated there again! Even though we have no chance to get there any further, because we did not have a release since a couple of years now, we are simply very proud of our [PAD]Community, who keeps on playing the game and is not leaving us down. 2017 – World of Padman still ranked under the Top 300 released indies of the year with only 50 votes missing to be voted into the Top 100. 2011 – World of Padman got nominated into the list of the Top 100 released indies of the year. Originally WoP was the top 101 indie with exactly one vote missing to get voted into the top 100. But after one participant of the content was proofed cheating, it got excluded from the contest and we were lucky to get listed under the top 100 released indies of the year again. 2010 – World of Padman got nominated into the list of the Top 100 released indies of the year. One of the sixth last votes was for World of Padman, so we are attached to the scoreboard forever. 2009 – Not World of Padman, but the X-Mas WoP modification got featured and mentioned in A Year in Review – December. 2007 – World of Padman got nominated into the list of the Top 100 released mods and indies of the year and made it as fourth-best indie game of the year 2007. Watch the Player’s Choice Winners Showcase (from 6:35)! 2006 – World of Padman as a modification for Quake 3 Arena got nominated into the list of the Top 100 released mods and indies of the year and the PadMod got a honourable mention in the categories Visuals and Upcoming Standalone in the Editor’s Choice Showcase. World of Padman also appears in the 2006 Mod of the Year trailer. 2004 – World of Padman as a modification for Quake 3 Arena got nominated into the list of the Top 100 released mods and indies of the year and received the ModDB’s Visual Delight award. 2002 – World of Padman, as a modification for Quake 3 Arena still in development, received ModDB’s Creativity Award.